The history of flying cars has been filled with crazy designs and innovative ideas. Some have been successful while others never got off the ground. Ever since man figured out how to get around on something other than his own two feet, we've dreamed of flying to our destination. From the Pegasus to the Fokker, we've been on a centuries-long quest to take to the skies. When cars were invented and became common, it was only natural that they would become the next focus for our flying commute. Here are some of the more interesting ideas that engineers and.. well, crazy people.. have put forward as flying car options. Some were feasible, others were just dreamy. Most were destined to never get off the ground. Built as a prototype by Glenn Curtiss, whose family appears to have been big fans of double letters, the Autoplane was only 27 feet long with a payload capacity (including passengers) of just 710 pounds. It was pretty innovative for its time, though, despite the fact that it never actually left the ground for anything more than a bunny hop. It suffered from an airspeed to weight problem. Before there was Fiverr on the Internet, there was the Flivver competition from the U.S. Air Commerce Bureau in 1933. The challenge was to create an airplane that cost less than $700. One entry was Waldo Waterman's Aerobile concept. The car-plane used a Studebaker engine, had a steering wheel in the cockpit, and had plans for removable wings. The Great Depression put a big damper on this flying car's hopes, though. It never achieved certification, but it did fly. Imagine a 1940s Chevrolet topped by wings and a propeller. That's the Convair. Created by industrial designer Henry Dreyfuss, the car was a four seater onto which wings with an engine and propeller could be attached like an oversized luggage rack. When not in use, they could be folded up and towed behind the car on the road. Surprisingly, this odd idea was relatively popular amongst engineers of the time, but when it crashed during a test flight and killed its pilot, investors disappeared. With a name like Molt Taylor and friends like Robert Fulton, Jr. (inventor of the failed Airphibian), a car like the now-famous Aerocar was just destiny. The Aerocar used the same design as the Airphibian, but improved on it greatly by making a more drivable car and adding on the Convaircar's idea of wings and tail going into a trailer for towing. The Aerocar was one of the few flying cars that went to market, with six models eventually being built and certification being achieved in 1956. Though it never went to full production, one of these cars is still flying today. What idea could be better than taking a 1970s Ford Pinto and strapping wings to it? Not many. 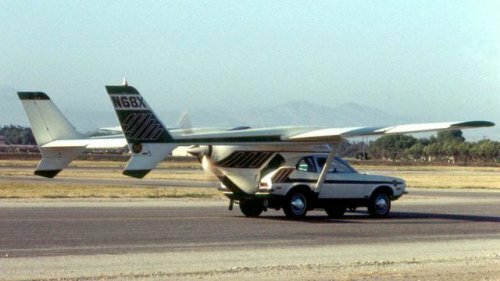 Calling themselves the Advanced Vehicle Engineers, a group in California took the flight assembly from a Cessna Skymaster, strapped it onto a Ford Pinto, and planned a sales price of $18,300 for the contraption. On a test flight the fall of 1973, however, its inventor Henry Smolinski and its pilot Harold Blake were killed when the right wing strut collapsed in flight. Making a splash this year at auto shows in the U.S. and Canada, the Terrafugia is a new take on the flying car designs of the past. It's a car with a hard-to-pronounce name, a strange front bumper and wings that fold skywards like a fighter jet on an aircraft carrier. The car is extremely air worthy, however, and was designed by engineers from MIT. It seats two plus a few groceries or bags, and is now ready to go to production with sales aimed for sometime next year. Don't expect great gas mileage, though. You can't have everything..
Veryawesome stuff. love the Pinto remarks.